The Indiana Puzzle is a perfect block to start with if you are new to making quilts. 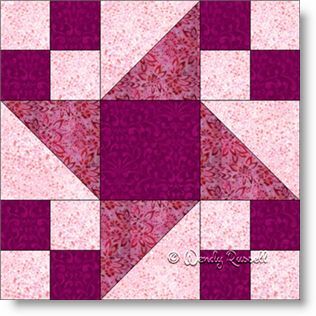 This quilt block uses simple squares and the most common pieced quilt patch called the half square triangle. This particular patch will be seen in many, many quilts that you will see in your quilting journey. The Indiana Puzzle block also will introduce you to the most common quilt block layout -- the nine patch, so named because the final construction of the block uses nine patches to make up the quilt block. The sample quilts illustrated show just how very different your resultant quilt can be, just by choosing a different layout than another quilter.